fossil record and why, in ecological and adaptive terms, did such evolutionary transformations occur? Previous studies of primate origins have primarily addressed these sorts of questions: What were early primates like in terms of their biology and behavior (e.g., Covert, 1986; Kay, 1984; Szalay, 1981)? What taxa might be the closest relatives of euprimates (e.g., Beard, 1993; Szalay et al., 1987; Wible and Covert, 1987)? What is the functional and adaptive significance of derived euprimate features, such as a postorbital bar, orbital convergence, and grasping extremities (e.g., Cartmill, 1972, 1992; Ravosa et al., 2000)? Stern (1998b, 2000) has suggested that recent advances in developmental genetics now allow evolutionary biologists to ask a third type of question; namely, how do new morphologies arise via evolutionarily relevant mutations? Thus, one question we may now ask concerning primate origins is how did the derived phenotype that characterized basal primates come into being in the first place? In other words, how did the first primates modify their ancestral developmental program to yield a new skeletal morphology recognizable as distinctive from that of all other placental mammals over 50 million years ago? Experimental observations suggest that the architecture of development facilitates evolutionary change within particular spatial domains or modules. The limb represents one such module, and within the limb field morphology of the autopod (hand and foot) is especially variable interspecifically. Experimental genetics illustrates how redundancy of gene function, robustic-ity in the face of mutational changes in skeletal patterning, and a degree of developmental autonomy together increase the potential for morphological change within the autopod. These factors contribute toward the production of novel limb phenotypes and are therefore likely to have played an important role in the diversification of skeletal form within modern mammalian clades and among early eutherian mammals as well. The experimental, comparative, and paleontological data presented in this chapter provide evidence that evolutionary change in developmental patterning of the digital rays was key to the origin of the order Primates. The next challenge for primate evolutionary biology is to identify the specific mutations implicated in the origin of the primate morphotype. As discussed in an earlier section, in the case of the autopod, these evolutionarily relevant mutations do not involve changes in regulatory protein structure. Rather, these mutational changes are more likely to occur in cis-regulatory regions, which affect the timing and location of regulatory protein expression. Identifying these mutations is a formidable task, since DNA-binding proteins typically recognize a core 6-9 base pair sequence and these sequences can be nested within long noncoding regions located at variable distances from the particular gene that they influence (Carroll et al., 2001). One strategy that has already proven useful for investigating the evolution of anthropoid globin genes is outlined by Chiu et al. (1999). Briefly, a comparison of DNA sequence alignment among extant primate taxa permits the identification of conserved cis-sequence elements that comprise an enhancer region. Protein-binding or transgenic experiments can then be used to investigate the effects of particular enhancer sequences on gene expression and morphogenesis (Chiu and Hamrick, 2002; Chiu et al., 2000). The integration of this experimental research with comparative and paleontological evidence is certain to expand on our present understanding of the mechanisms important in the origin of primate skeletal form. 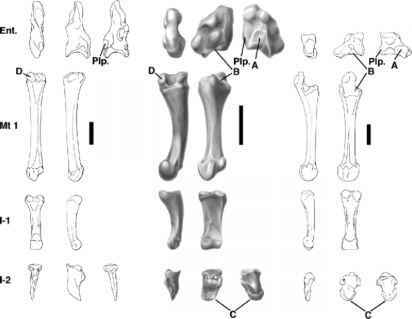 Data presented here on hindfoot proportions show that primates, including Early Tertiary adapiforms, such as Europolemur, Godinotia, and Notharctus, are derived relative to tree shrews, dermopterans, and Plesiadapis in having relatively long-proximal phalanges and short-terminal phalanges. These data provide strong support for the hypothesis that primate origins involved an evolutionary change in digital-ray patterning yielding hands and feet with relatively long digits and reduced claws. These comparative results should, however, be viewed with some caution because the cheiridial morphology of many early primates is still unknown. For example, omomyid primates comprise a family of approximately 80 species, which existed throughout North America, Europe, and Asia during the Eocene epoch, yet, only terminal phalanges and hallucial metatarsals have been described for this group. A diverse haplorhine fauna from the Eocene of China is also now known from dental and tarsal remains (Beard et al., 1994; Gebo et al., 2000a, b), but morphology of the fingers and toes in these animals has not been described. The anatomy of these creatures is critical for understanding the pattern of cheiridial morphology primitive for the order Primates (Euprimate morphotype). Finally, recent molecular studies (Liu et al., 2001; Madsen et al., 2001; Murphy et al., 2001) suggest that tree shrews (Scandentia) and colugos (Dermoptera) are the closest relatives of primates. Unfortunately, the fossil record for these two Orders is very poor. New discoveries of plesiadapi-form skeletal remains (Bloch and Boyer, 2002) clearly show that digit proportions among early archontan mammals were much more varied and diverse than previously thought. Our understanding of the temporal and phy-logenetic sequence in which the derived skeletal features of euprimates was acquired will remain incomplete until postcranial remains of early tree shrews and dermopterans are found.